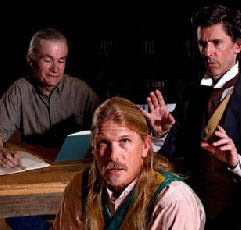 Cleveland poet and performer Ray McNiece is on stage in the Cleveland Public Theatre's debut production of "Open Mind Firmament," a play about William Butler Yeats, and most specifically focussed on Yeats' Cuchulain cycle, a series of short plays about incidents in the life of the mythic Irish hero Cú Chulainn (the pronunciation of whose name, by the way, is a subject of some scholarly debate: Yeats prefered the pronunciation "ku-HOO-lin"). Yeats was himself intimately involved with the theater (along with friends, he established the Irish Literary Theatre to produce Irish and Celtic plays), on a mission to produce a form of theatre that avoided "vulgar realism" in favor of an avant-garde theatre emphasizing symbolism, nuance, and poetry. Roy Berko calls this production "visually compelling"-- I'll agree with that; the stagecraft (on a very nearly empty stage) is magnificent. This is a performance combining symbolism, dance, scholarly analysis, and Irish song. I think Yeats would be proud. And Ray McNiece is brilliant in the role of Cuchulain. Better check it out soon, though (7pm, Thursday through Sunday, 6415 Detroit Avenue Cleveland)-- after Sunday's, next week will be the final weekend. Yeats' poem "Cuchulain's Fight with the Sea"
Would you lke to share this with the class? I don't know how reputable Indigo is - but I think the spot is cute. Like I tell my classes of middle and high school boys - chicks dig poets. "There are three rules to writing a novel and nobody knows what they are." "Writing is finally a series of permissions you give yourself to be expressive in certain ways. To leap. To fly. To fail." “All good writing is swimming underwater and holding your breath." "All I am is the trick of words writing themselves." Tuesday, May 18th at 7 pm at Legacy's Joseph-Beth Bookseller in Lyndhurst...Cleveland native Susan Streeter Carpenter will read from her new novel RIDERS ON THE STORM, set in Cleveland's radical 1960's era. It's a rousing and thoughtful novel that brings some sense to a turbulent time in our history....with echoes of today. 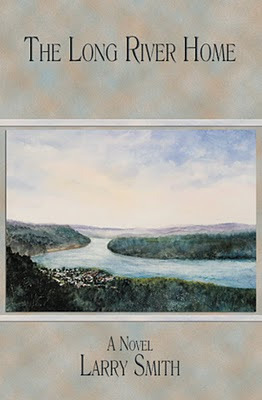 Susan teaches writing at Bluffton University and will be a presenter at the Antioch Writer's Conference and Island Writers Retreat this summer. Join her...Mary Grimm will provide the introduction. John Gallaher, "Nothing to Say, and Saying it," has a great post from poet Franz Wright about the failings of the MFA generation. "...the bar was so lowered that per year maybe hundreds or thousands of pieces of paper (if you paid your tuition, or were a good low-level instructor slave) are issued stating that somebody in his or her mid twenties is now a MASTER of the art of poetry. Then you get the insane self-consciousness of the internet going, and put it all together and you get a couple or few generations of the most abject mediocrity, not in thought—anyone can blabber intellectually—but in the art of the poem which is made of out solitary silent meditation, made out of everything that is the opposite of what you kids daily invest so much importance in. You poor dupes." --the comments to the critique are mostly cheap shots at Wright, alas; pointing out that, although Wright may write a mean anti-MFA essay trashing his former students and colleagues, he never turns down a gig. As for myself, although I can claim to be a master of many things, I'm afraid mastery of fine arts is not one of them. So I don't really have a dog in this fight, I'm just in it for the amusement of watching the bloodshed. So, if you have some comments about the MFA generation, leave 'em here! Me, I'm off to rectify my failings by writing some poems about the ramifications of the new global culture. --see also the earlier post: There's Too Much Money in Poetry! 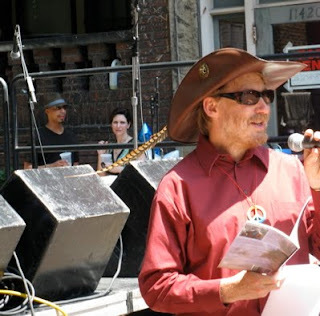 Celebrate the 41st Anniversary of the Hessler Street Fair with poetry! 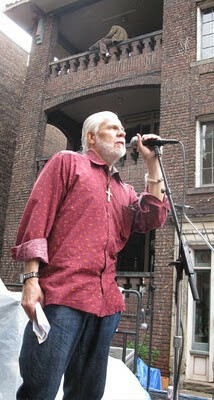 The finalists for the 2010 Hessler Street Fair poetry contest anthology have been selected. 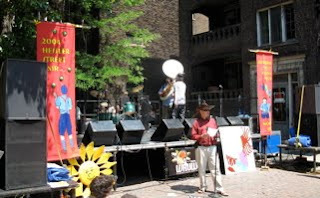 Come to Mac's Back's Wednesday, May 12th to hear the poets perform their poems, or come to the Hessler Street Fair on Sunday May 23 to hear the winning poets read at the fair (simulcast on WRUW 91.1 FM). 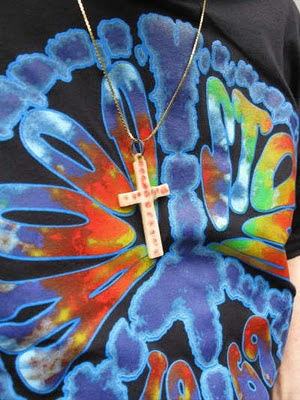 Or just come to the Fair to experience the place where tie-dye never went out of fashion! 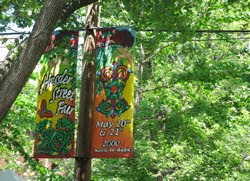 The Hessler Street Fair is an annual community arts and music festival on historic Hessler Street in University Circle. It is a family-friendly event showcasing local artists, food, musicians and poets, attracting upwards of 10,000 visitors each year. It features a diverse mixture of musical styles and venues, and is a non-profit, volunteer-run weekend, focused on celebrating community, arts and culture. The fair runs Saturday and Sunday, May 22 and 23, 2010, from 11am until Dusk. 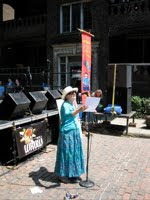 The Hessler 2010 Poetry and Prose Anthology is available for purchase for $8.00 new low price of five dollars from Mac's Backs bookstore, 1820 Coventry Road, Cleveland Heights, or buy a copy during the fair at the Hessler Street Fair Booth at Hessler Rd. & Hessler Ct.. 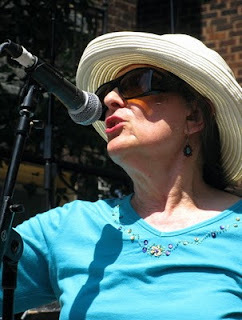 If you like to have a little libation along with your poetry, the Hessler Street Fair poetry will also be continuing at the Barking Spider on Saturday. Drop by and join the celebration. I'll be there with my all Ohio novel. Francis Bacon’s “Three Studies for Figures at the Base of a Crucifixion” as well as Virginia Woolf’s Mrs. Dalloway. Kate hails from Chicago and lives in Akron, where she teaches gender studies. Rachel Levitsky's innovative, smart, and beautifully designed new book Neighbor (Ugly Duckling Presse 2009) illuminates the odd relationship between urban neighbors through a dated log of poetic entries. She is the author of Under the Sun (2003) and the forthcoming The Story of My Accident is Ours (2010), both from Futurepoem Books. 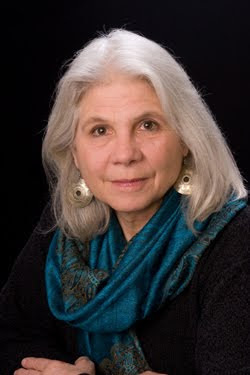 In 1999, Levitsky founded Belladonna Series (belladonnaseries.org) as a means to amplify the hushed existence of the feminist avant garde practice of writing. 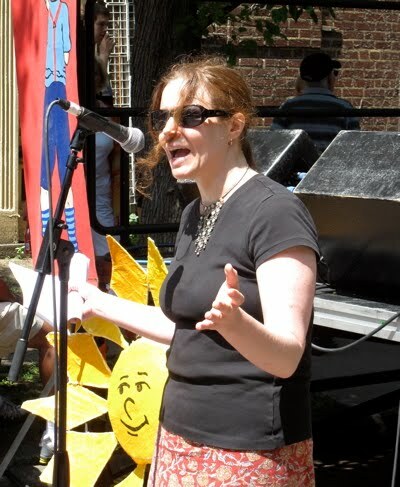 She teaches writing and literature at Pratt Institute in Brooklyn, NY. Michael Dumanis teaches literature and creative writing at Cleveland State University, where he serves as Director of the Cleveland State University Poetry Center and edits the books in their poetry and novella series. 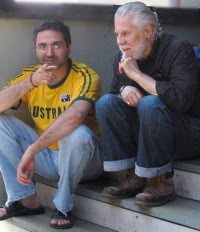 His first collection of poems, My Soviet Union won the Juniper Prize for Poetry from the University of Massachusetts Press and appeared in Spring 2007. 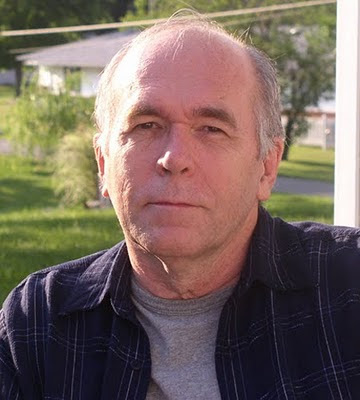 His poems have appeared in such journals as Conduit, Crazyhorse, Denver Quarterly, New England Review, Post Road, Prairie Schooner, and Verse, and his writing has been recognized with a Fulbright Fellowship (to Bulgaria), a James Michener Fellowship in Fiction, and fellowships to Yaddo and the Wesleyan Writers' Conference.